The VEEMUX® 4K HDMI Matrix Switch Over HDBase-T with Power Over Ethernet routes and distributes Ultra-HD 4Kx2K, multi-channel audio, Ethernet, and IR from eight HDMI video sources to eight displays via inexpensive CAT7 cable using HDBase-T technology. Power over Ethernet provides power to receivers that can be located up to 375 feet away. Also known as: HDMI Matrix Switch over HDBase-T, HDMI A/V Matrix Switch via CAT5, Ultra-HD 4Kx2K HDMI matrix switch, Route 1080p over CAT5, HDMI matrix switcher, digital video router, HDBaseT video matrices, HDTV digital audio/video matrix switch. The VEEMUX® 4K HDMI Matrix Switch Over HDBase-T with Power Over Ethernet routes uncompressed digital HDMI signal and IR from eight HDMI video sources to eight displays (projectors, monitors, etc.) and speakers via inexpensive CATx cable using HDBase-T technology. 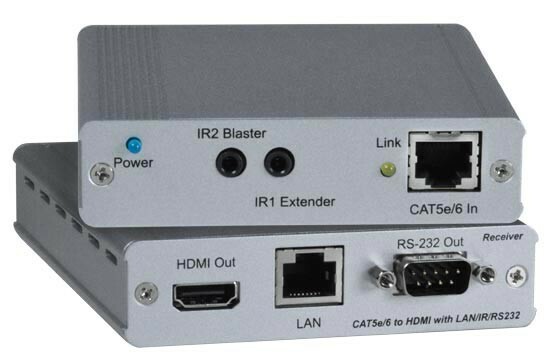 It is capable of connecting to as many as eight HDMI video sources directly and eight video displays via receivers with a maximum extension of 375 feet from the switch using CAT7 cable. Power over Ethernet (PoE) provides power to all connected receivers. Configure and control the switch through Ethernet, serial port, front panel buttons, or IR remote control. Supports Ultra-HD 4Kx2K resolutions to 4096x2160, HDTV resolutions to 1080p, and computer resolutions to 1920x1200. With CAT5e (24 AWG), up to 250 feet. With CAT6 (23 AWG), up to 350 feet. With CAT7 (23 AWG), up to 375 feet. Supports Power over Ethernet (PoE) - power supply not required at the remote unit. No loss of audio or video quality between the switch and remote units. Bi-directional IR from input and output locations. Supports external and internal EDID settings. Features an Ethernet port on the switch and receivers for connecting network devices such as 100Base-T routers, hubs, smart TVs, or smart Blu-Ray players. Eight female RJ45 HDBase-T connectors for sending/receiving ultra high definition video, audio, IR, Ethernet and DDC signals. Eighteen female 3.5mm ports for IR transmitters and receivers. IR transport channel is bi-directional - the transmitter or receiver can be connected to the switch. "All IR" input or output transmits signals to multiple transmitters or receivers within direct line-of-sight. One female Ethernet port for Telnet and web server control, and/or for connecting a network device such as a 100Base-T router, hub, smart TV or smart Blu-Ray player. One female DB9 connector for RS232 control. One Mini USB Type B connector for firmware updates only. 100 to 240 VAC at 50 or 60 Hz via AC adapters. One powers the switch and the other provides Power over Ethernet (PoE). Operating/storage relative humidity: 20 to 90% non-condensing RH. One female HDMI output connector. One female RJ45 HDBase-T connector for sending/receiving high definition video, audio, IR, Ethernet and DDC signals. Two female 3.5mm ports for connecting an IR transmitter or receiver. One female Ethernet port for connecting a network device such as a 100Base-T router, hub, smart TV, or smart Blu-Ray player. Powered by matrix switch via Power over Ethernet (PoE). 8-bit resolution: up to 49 ft (15 m). 12-bit resolution: up to 33 ft (10 m). Output: 20 ft (6.1 m). Use CAT5e/6/7 solid straight through cables for TIA/EIA 568B wiring terminated with standard RJ45 connectors. CAT5e (24 AWG), up to 250 feet. CAT6 (23 AWG), up to 350 feet. CAT7 (23 AWG), up to 375 feet. 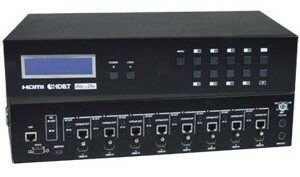 Combine NTI's video converters, extenders, and scalers for complex applications. Supports HDTV resolutions to 1080p only. Requires USB power to operate. Supports HDTV resolutions to 1080p and computer resolutions to 1920x1200 only. LED display shows which input device is being used by each output device. The matrix switch can be controlled with the included IR remote using the built-in IR receiver on the switch or remotely via an IR receiver or emitter connected to the remote unit. HDMI sources can be controlled remotely using the source's IR remote control through the remote unit's IR receiver and switch's emitter. Control the unit's power, input/output ports, and EDID. Reset the IP configuration of a device. When the Matrix Switch is connected to a network, it will share the network access with all connected receivers. Any Ethernet equipped device (e.g. Smart TV) can be connected to the receiver to share the network / internet access.